We are back at the Ilar Verniciature plant in Chiari, Brescia, this time at the suggestion of Superfici (SCM Group), the famous producer of painting machines located in Monza and represented during our visit by Alfredo Zanconi, who accompanied us in a tour which was guided by Ilar Verniciature's owner, Angelo Ghilardi, and his daughter, Ilaria, who gave the company its name and who manages with extraordinary expertise the tinting machine to obtain the colour charts and samples. That of Ilaria Ghilardi is an ability that is mostly instinctive – to successfully create perfect colours without even needing to use tintometric technology: simply incredible. Let's begin with Ilaria and "her colours”, because right from the start of our interview with her and her father we realized that the “synergy” between the Ghilardis is the key to their success. Ilar Verniciature was founded in 1998. We had our first meeting a few years later, during the early stages of the economic crisis. We feared therefore that the economic situation might have affected also our friends from Chiari, despite the fact that our first visit had made us understand clearly what Angelo Ghilardi was made of. However, from experience we knew that though this company had a number of reliable clients, it might also have become a victim of the general market crisis, and so we embarked on our visit with moderate expectations. Our expectations were based, however, only on what we had seen first-hand: a plant that was quite impressive already then, with a good level of automation demonstrated by painting reciprocators, the use of water-soluble paints from a leading brand (ICA from Civitanova Marche, still an Ilar supplier), the well-trained human resources, and other aspects. The necessary elements for success had been there, therefore, and our second visit has indeed confirmed it. We are welcomed by Angelo and Ilaria Ghilardi, and our attention is immediately drawn to a robot (which replaced the reciprocators) set in the painting department directly in front of the plant gate, a sort of a welcoming figure as well as trade mark of a company with its face turned to the future. 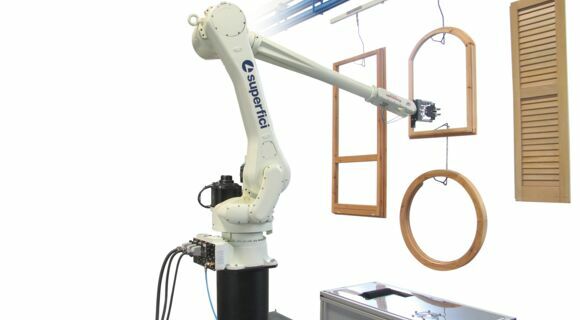 It is a fully autonomous 7-axis anthropomorphic robot that treats door and window frames hung on ninety hangers of a moving system over a dual-rail conveyor. The seventh robot axis is that of the automatic spraying gun, which can reach with absolute precision every hidden corner of the workpiece. The dual-rail system ensures the absolute stability of the hanging workpiece, which appears firmly stable with no oscillation whatsoever to the robot, ready in the best conditions to receive the coating product, be it the primer or the final coating. 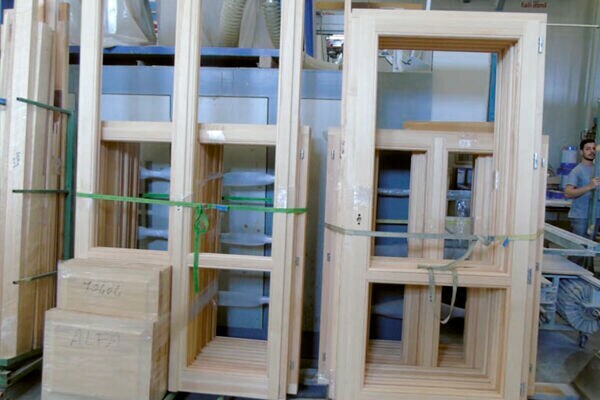 Ilar specialises in lacquered doors and windows, also two-tone coating which is a current trend, managing thanks to the robot, as mentioned before, up to ten different colours a day. The automatic colour change is performed by the robot as well. 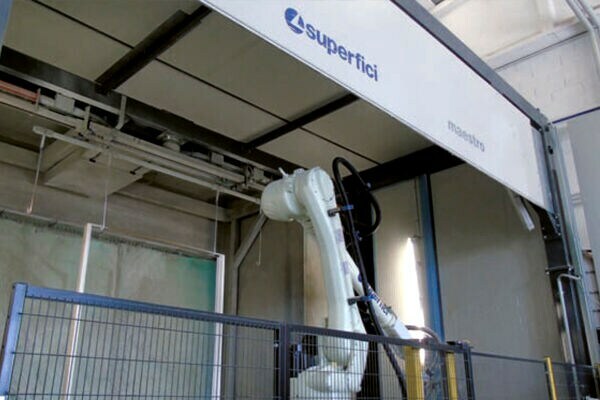 Obviously, by following a computer programme, selected for each type of work cycle, the robot can simultaneously paint door and window frames with different colours and periodically rinse the nozzles in the machine cleaning system, while a ‘martyr hanger’ – as Alfredo Zanconi of SCM Superfici fittingly calls it – divides one group of workpieces of a certain colour from the next group of a different colour which will be painted after the nozzles will have been rinsed: a “factory within a factory”, with no need for manual intervention. Painting work cycles include a primer layer, an undercoat and two finishing coats, all separated by hot air drying and sanding of the undercoats. It should be noted that sanding is wisely and expertly separated from the painting operation; the result is a contamination-free, smooth as silk finished product. Never-resting Ilar: Currently being prepared is an extraordinary vacuuming system that removes paint overspray (non-soluble particulates, existing also in water-based paints) and sanding dust. A sleeve-based system that vacuums the air in the entire building, treated as one big booth, filters it and discharges the contaminants outside. Another great innovation, not required by the Environmental Protection Authority (Ilar operates in full conformance with current laws and standards), but required by Ghilardi's irrepressible desire to be a true model. The size of investment will once again be considerable, but we, who have twice witnessed the results of the company's investments, have not the slightest doubt that also this time the return on such investment shall at least equal it, or more likely surpass it. We deliberately wanted to tell the Ghilardis’ business story – past, present and future – because we believe that our readers would be best served by seeing up close systems of excellence, such as the robot that is described here, but also learning from the experience of companies that operate with a positive balance and serve as true monitors of what is called the “crisis” scenario, which has often been viewed and is still viewed as a condition of laxness and indecision, admittedly caused by real circumstances at times, but often accepted as an “epidemic”, as an excuse to “not doing”. Here is the whole point: Ilar Verniciature is “doing”.